1199(W)x590(D)x750(H), work surface 18+/-0.5mm thk, C frame of 0.9+/-0.09mm thk, it have 3 drawer : 355.5mmWx559mm Dx433.5mm H with shell of 0.5+/-0.07mm thk, IS-513/, IS10748/, IS-2062 , IS-7138, top str.frame -1165mm (W)x558mm (D). 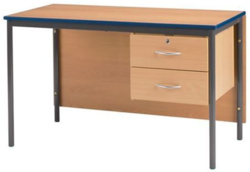 Teacher table made of wood size 4’x2’x2 ½’ having three drawer for the storage. - Table top of the Classroom Teacher Table is made of laminated MDF or Particle Board or Ply Wood (as per choice) with PVC edge banding. - the Classroom Teacher Table under structure is Powder coated sheet metal book shelf. 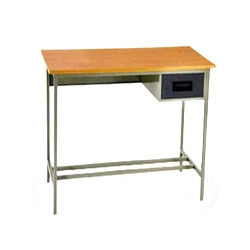 We are leading manufacturers of Teachers Tables.